11-18 school, it has approximately 1,750 students. Founded in 1963 Little Heath school celebrated it's 50 year anniversary in 2013 and is proud of its reputation as a traditional school built on old-fashioned values. 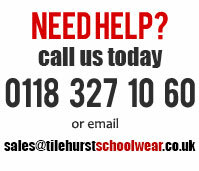 We now fully stock all Little Heath School uniform for boys and girls of all ages. This inlcudes the new standardised Skirt and trousers for girls, standardised trousers for boys and all new P.E. kit. All are compulsary from September 2015.